Four dreaded words that echoed the meeting rooms of our old Home. It’s crazy to think that not having enough space affected our business as much as it did. But it was killing us. We weren’t able to have the meetings we needed, when we needed them. Interruptions like ​‘How much longer will you be?’ or ​‘We need to do a conference call in five minutes…’ stopped an idea in its tracks just as it was getting started. I knew something needed to change. We started to think about how we wanted to work. How do we want to ​‘be’ as a company? It’s not an easy question to answer, as there’s no definitive right or wrong. Our Homies are all different and work at their best in different ways. But it is an essential question that I urge every leader to ask if they are thinking of making a move like we have. Our requirements were a real mixed bag. Everyone wanted to be together, which can only be a good sign. Lots of us wanted the flexibility to be able to get some quiet time out of the hustle and bustle of the studio. We clearly needed more meeting rooms. We also wanted plenty of collaborative spaces – where project teams could come together to think things through and work at their own pace without interruptions, or where we could invite our clients to share their experiences, reflect and plan. We loved the idea of a space that could be used as an art gallery (every studio needs one of these). Given that we are famous for our weekly Wednesday lunches we wanted a top-notch kitchen and a table big enough for everyone to be able to pull up a chair and sit down and eat together. So the search began. We needed to find our new home!!! If we saw one building we must have seen a hundred. Nothing really spoke to us. Nothing made us stop and go this is the place. There are plenty of spaces in Bristol that are perfectly adequate, but adequate isn’t a word that sits very well with us, especially when we would be spending so much time there. We were fussy but I think you need to be. You need to get it right!!! You need to constantly remind yourself why you are doing it and what your collective dream is. Our search lasted for a couple of years. We followed many different paths, entertained many different spaces and kept our options open. But when you know, you just know. We eventually found an empty warehouse in BS4 that was just perfect. Ok, we needed a lot of vision to see it and we needed to give it a whole lot of love to make it suitable for us, but it ticked every box and it just felt right. We’ve been in our new Home for a couple of months now and the difference has been incredible. Until the move I hadn’t appreciated how much a building could hold us back, but now we’ve got this great creative space. 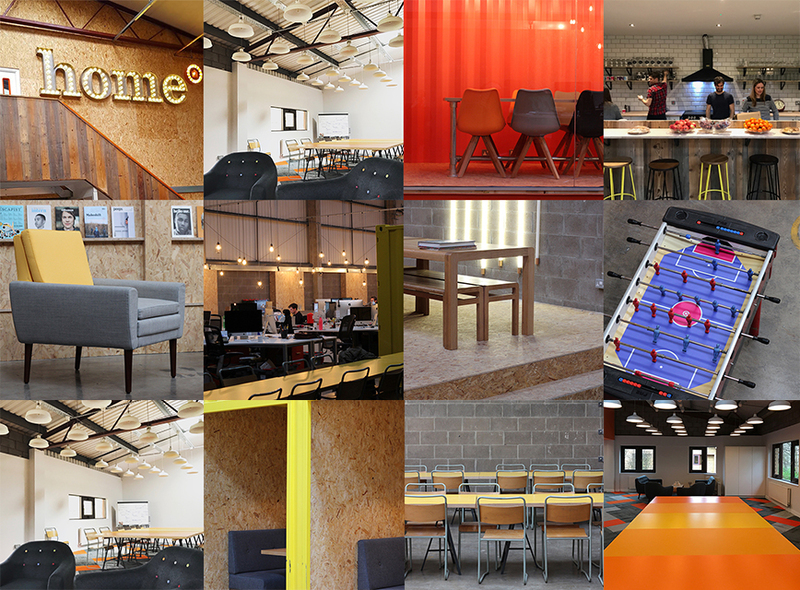 It is completely flexible and full of interaction and collaboration – plus loads of spaces to be quiet in. I can already feel the change in people’s energy. Weirdly, having more space has somehow brought us even closer together. It’s connected us and united us as a team, not just on a work level, but a social one too. Our new Home suits the way we want to work with each other and our clients. It will allow us all to grow and ultimately take our business to the next level. For those of you reading this who control the purse strings – not only are we working better together, we’re working a lot more productively too. So much so, that we have just completely smashed our top quarterly target, a figure that we struggled to achieve in our last office! Maybe it’s just a coincidence, maybe we just happen to have a lot on… even so in our old building it would have felt a million times harder. I’m delighted to say the phrase ​“is this room booked?” is a thing of the past here at Home, and I wish anyone who is about to embark on a similar journey good luck – the months of planning, weeks of packing and days of moving have all been worth while.